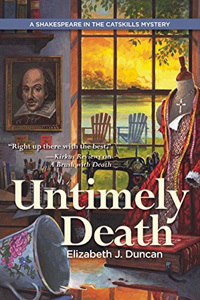 Untimely Death by Elizabeth J. Duncan: Synopsis and Online Purchase Options. Synopsis (from the publisher): A Catskills resort's production of Shakespeare's Romeo and Juliet takes a wickedly ironic turn when the leading lady, Lauren Richmond, is first poisoned and then stabbed. Who would extinguish the life of such a beautiful young thespian? Who wouldn't? Seems like just about everyone had a motive to pull the ropes on her final curtain call. At the center of this Shakespearian tragedy is Charlotte Fairfax, formerly the costume mistress of the Royal Shakespeare Company. Upstate New York is a long way from the royal stage, but Charlotte is always the queen of her domain. As this small production's costume designer, she has stitched her way into everyone's lives, learning more than anyone could possibly imagine about the rise and fall of Lauren Richmond. But curiosity killed the cat. And it might well kill the costume designer.